This CellML model runs in OpenCell and COR but does not recreate the published results (figure 1). The units have been checked and they are consistent. The equations appear to match those in the paper (1-5) and the parameter values have been taken from table 1. The CellML model simulation output fails to oscillate. ABSTRACT: According to a previously proposed mathematical model, the pathogenesis of acquired immunodeficiency syndrome (AIDS) could be explained by two phenomena: direct human immunodeficiency virus (HIV) infection of CD4+ T-cell populations and ongoing generation and selection of HIV mutants with increasing replicative capacity. In the present paper, the results obtained with this model are described in more detail. For different values of biologically interpretable parameters, the model predicts very different patterns of CD4+ T-cell decline after primary infection. With the assumption of a variability of 10% to 25% of three parameters between infected individuals, the model yields a realistic distribution curve of the incubation period to AIDS. 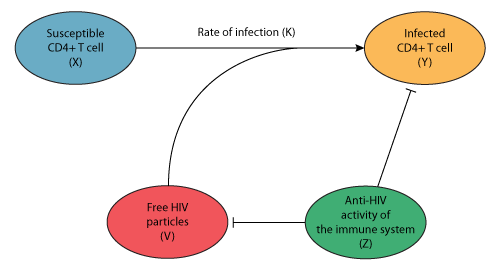 A schematic diagram showing how susceptible T cells are infected by free HIV particles at a rate K to become infected T cells. This process is influenced by the anti-HIV activity of the immune system against infected T cells and HIV. Note: X: The number of susceptible (non-infected) CD4+ T cells, Y: The number of HIV-infected CD4+ T cells, V: The number of free HIV particles, Z: The anti-HIV activity of the immune system towards removing infected CD4+ T cells and HIV, and K: The rate at which HIV infects susceptible CD4+ T cells. Derived from workspace Stilianakis, Dietz, Schenzle, 1997 at changeset 0ddb68acd791.